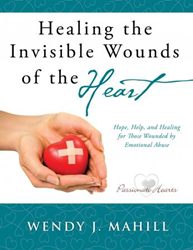 Wendy J. Mahill’s new book, Healing The Invisible Wounds Of The Heart - Hope, Help, And Healing For Those Wounded By Emotional Abuse, ($18.99, paperback, 9781498465588), is book five in the Passionate Heart Series. This latest book is designed to help people uncover and examine and heal the wounds caused by various kinds of emotional abuse that may be interfering with the life and relationships to which God calls them. Mahill provides a thorough understanding of the emotional abuse that people endure in all kinds of situations and provides exercises that will help people recover from the effects. It also helps people to understand the impact of their behavior on their families, fellowship of believers, and their friends. Wendy J. Mahill serves as a lay counselor at RiverLakes Community Church in Bakersfield, California. She is a member of the American Association of Christian Counselors and the director of the Passionate Heart Ministry that provides support groups for women who have survived childhood sexual abuse, who have struggled with eating disorders, who have struggled with painful emotions, and who have struggled with dysfunctional relationships. Wendy has been married for 42 years, is the mother of five grown children, and enjoys being grandmother to six grandchildren who’ve nicknamed her “Jam.” She has personally dealt with painful emotions as a survivor of childhood sexual abuse and has taken great strides in overcoming a long-term eating disorder. Xulon Press, a division of Salem Media Group, is the world’s largest Christian self-publisher, with more than 15,000 titles published to date. Retailers may order Healing The Invisible Wounds Of The Heart - Hope, Help, And Healing For Those Wounded By Emotional Abuse through Ingram Book Company and/or Spring Arbor Book Distributors. The book is available online through xulonpress.com/bookstore, amazon.com, and barnesandnoble.com.